This is a recipe that was passed down to me from a friend and I’m very thankful that she was sweet enough to share this sweet treat. Prepare cake according to package directions using a 13 x 9-inch baking pan. Cool completely in pan on wire rack. Mix caramel topping and condensed milk together. Poke holes in cake about 1-inch apart and 1-inch deep using handle of wooden spoon. Pour sweetened condensed milk and caramel mixture over cake. 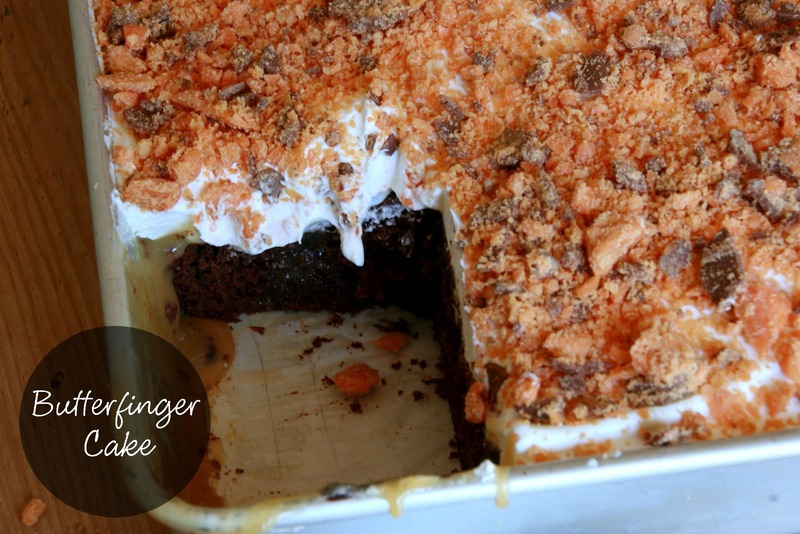 Spread Cool Whip on top of cake and sprinkle Butterfinger crumbs on top of Cool Whip. Cook’s Notes: By putting holes in your cake, this will allow the caramel to seep into the cake and the taste is out of this world. One of our family’s favorite desserts.